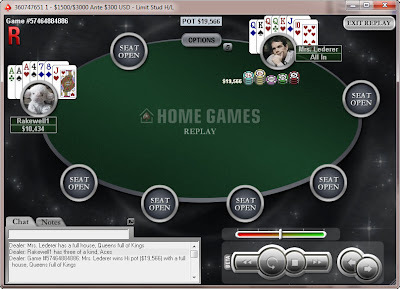 Mike Caro recently posted an interesting riddle on his blog: "What's the weakest hold'em hand you can have and still end up on the river with an absolute certainty of victory?" I got the answer right, but it took some thinking. Unfortunately, Caro doesn't explain the answer in detail, so I thought I would. Spoiler below, so don't scroll down until you've thought about it all you want to. The answer is three queens--specifically, two queens in your hand on a board that has these four characteristics: Queen high, unpaired, no three of any one suit, and no straight possible. E.g., Qs-Jd-7c-5c-2h. Here's why. The answer can't be any one-pair or two-pair hand, because three of a kind is always possible on any hold'em board, so you can never be sure that even top two pair is good. There are some boards on which nothing better than three of a kind is possible--if there is no pair (hence no quads or full house possible), no three of any suit (hence no flush possible), and the ranks are far enough apart that no two hole cards can bridge the gaps so as to make a straight. So the correct answer must be trips of some sort. Why queens, specifically? Well, whatever set we're talking about has to be made with the highest card on the board; otherwise, obviously, an opponent could have the higher set. So why not three jacks, say? This is the tricky bit. It's because on a jack-high board, the remaining cards will always have a possible straight somewhere. You can try constructing a board to avoid it, but you will fail. Start with a jack, then put in a ten. Now we can't add a 9, because that makes three different straights possible. We can't add an 8 because either 7-9 or Q-9 would make a straight. We can't add a 7 because 8-9 would make a straight. So our next card on the board has to be a 6. We now have J-10-6. But you'll quickly discover that any two final baby cards we put down will make a straight possible. Incidentally, once when I apparently had too much spare time on my hands, I sat down with a deck of cards and worked out how many different 5-card, unpaired hold'em boards could be made on which no straight would be possible. I counted 81 of them, which is only about 6% of the 1287 possible unpaired hold'em boards. See here. Here's another hold'em riddle that I heard from a guy named Steve that I used to play with frequently at the Hilton (though I'm sure it was not original with him): If you start with a 5-10 in your hand, there is one kind of straight that you will never be able to make, no matter what cards come on the board. What is it? I'll put the answer in as the first comment. My friend Wolynski just put up a blog post about smoking. 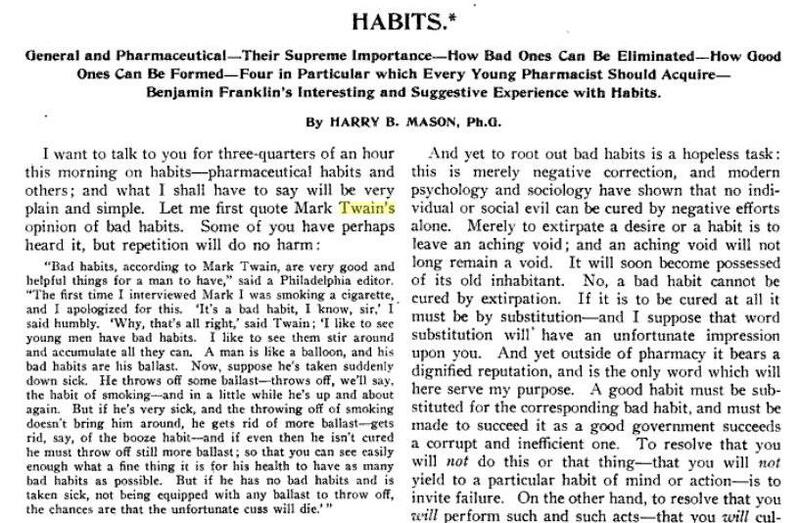 I wanted to post a comment there about what Mark Twain is reported to have said about smoking, but the only place I could find the story was in a Google Book. I couldn't cut and paste the text, and I couldn't post a screenshot image of it in her comments section, so I'm putting it here. "MORAL STATISTICIAN." --I don't want any of your statistics; I took your whole batch and lit my pipe with it. I hate your kind of people. You are always ciphering out how much a man's health is injured, and how much his intellect is impaired, and how many pitiful dollars and cents he wastes in the course of ninety-two years' indulgence in the fatal practice of smoking; and in the equally fatal practice of drinking coffee; and in playing billiards occasionally; and in taking a glass of wine at dinner, etc., etc., etc. And you are always figuring out how many women have been burned to death because of the dangerous fashion of wearing expansive hoops, etc., etc., etc. You never see more than one side of the question. You are blind to the fact that most old men in America smoke and drink coffee, although, according to your theory, they ought to have died young; and that hearty old Englishmen drink wine and survive it, and portly old Dutchmen both drink and smoke freely, and yet grow older and fatter all the time. And you never try to find out how much solid comfort, relaxation, and enjoyment a man derives from smoking in the course of a lifetime (which is worth ten times the money he would save by letting it alone), nor the appalling aggregate of happiness lost in a lifetime by your kind of people from not smoking. Of course you can save money by denying yourself all the little vicious enjoyments for fifty years; but then what can you do with it? What use can you put it to? Money can't save your infinitesimal soul. All the use that money can be put to is to purchase comfort and enjoyment in this life; therefore, as you are an enemy to comfort and enjoyment, where is the use of accumulating cash? It won't do for you to say that you can use it to better purpose in furnishing a good table, and in charities, and in supporting tract societies, because you know yourself that you people who have no petty vices are never known to give away a cent, and that you stint yourselves so in the matter of food that you are always feeble and hungry. And you never dare to laugh in the daytime for fear some poor wretch, seeing you in a good humor, will try to borrow a dollar of you; and in church you are always down on your knees, with your eyes buried in the cushion, when the contribution-box comes around; and you never give the revenue officers a full statement of your income. Now you know these things yourself, don't you? Very well, then what is the use of your stringing out your miserable lives to a lean and withered old age? What is the use of your saving money that is so utterly worthless to you? In a word, why don't you go off somewhere and die, and not be always trying to seduce people into becoming as "ornery" and unlovable as you are yourselves, by your villainous "moral statistics"? Now I don't approve of dissipation, and I don't indulge in it, either; but I haven't a particle of confidence in a man who has no redeeming petty vices, and so I don't want to hear from you any more. I think you are the very same man who read me a long lecture last week about the degrading vice of smoking cigars, and then came back, in my absence, with your reprehensible fireproof gloves on, and carried off my beautiful parlor stove. That's from Twain's Sketches New and Old, published in 1882, available from Project Gutenberg here. Wolynski also quoted Fran Lebowitz. Many years ago there was a segment on "60 Minutes" about smoking. 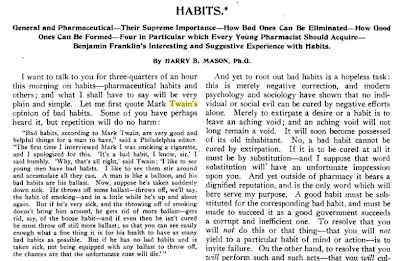 Mike Wallace (I think) asked Lebowitz something like this: "Doesn't it bother you that you could die from smoking?" She answered approximately this: "It would, if I thought that otherwise I wouldn't die from anything else." I will take the liberty of telling a relevant story on Wolynski, trusting that she won't mind. The first time I met her, we had lunch, then I offered to drop her off at Circus Circus (where she was going to take some pictures) because she doesn't have a car. I had to move a case of Coke out of my front seat in order for her to get in. As I did so, she scolded me: "That stuff will kill you, you know." Which wouldn't be funny, except that this warning was issued, without a trace of irony, between puffs on a Pall Mall. 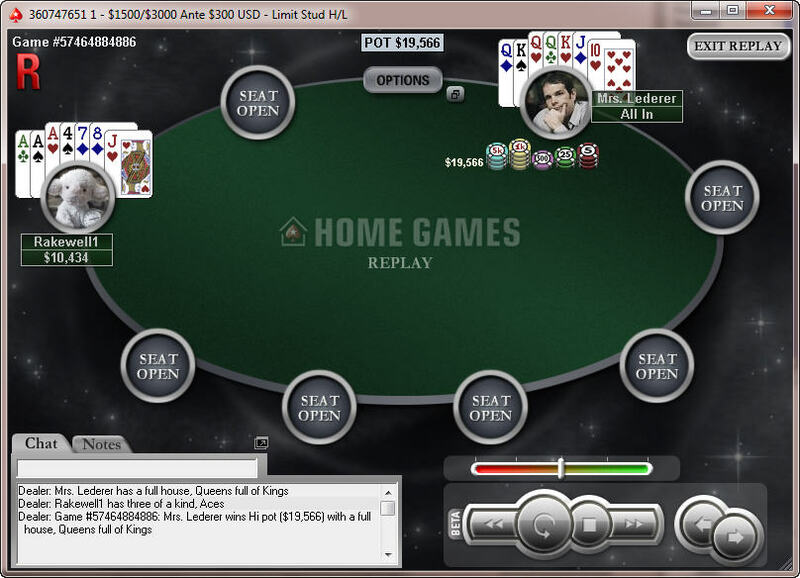 I just finished a home game on PokerStars. I was heads-up with Mrs. Lederer for the title and $15 in first-prize money. She had survived into the money only because when there were five of us left, she sucked out both a low and a flush with AA3 to beat my AAK in stud/8, capped on 3rd and all in on 4th street. I had to settle for 2nd place and $9. So disappointing. I just spent a very pleasant couple of hours rekindling an old romance. In 1996, Cecilia Bartoli, a beautiful Italian coloratura mezzo-soprano who spoke almost no English, appeared on David Letterman's show, singing Non piu mesta, the flashy, fireworks finale to Rossini's opera La Cenerentola. As was my habit at the time, I had taped the show to watch the next day, having no idea who the guests would be. When I saw the singer, I was blown away. I nearly wore out the tape watching it over and over and over again. Despite a lifelong appreciation for classical music, I had never understood opera. I saw it as bizarre. Not only was it not beautiful, it was downright irritating, like listening to the soundtrack of a catfight. The discovery of Cecilia made me start to question whether there was something I had been missing. Her appearance on Letterman started what has now been a 15-year love of an entire world of artistic endeavor that had previously eluded me. I started by buying three operas on CD (La Cenerentola, Carmen, and La Boheme) and listened to them while following the libretto translation. Most importantly, I enrolled in some adult-education classes about opera at the University of Minnesota. (As an employee and could take them for free.) The more I learned, the more I liked. Boheme in particular was an epiphany as to the intensity of emotion that could be conveyed through this art form as in no other. I found myself moved to tears by O suave fanciulla, then utterly devastated the first time I heard the final, desperate words before the curtain falls, "Mimi! Mimi!" When I get interested in something, I have a habit of going whole-hog, full-immersion, obsessive-compulsive. So it was with opera. I went on a buying spree, and ended up with something like 70 boxed sets of opera recordings. I listened to them every spare minute. (Later, when I got seriously into competitive shooting, I must have been quite an odd sight, sitting in my basement making thousands of rounds of ammunition on my Dillon loading press with Pucini blaring from a boombox.) I bought season tickets to the Minnesota Opera. I even subscribed to Opera News magazine. Opera is unquestionably an acquired taste, and I just kept on acquiring it. Through it all, Cecilia remained my favorite performer. I bought nearly everything she recorded, anticipated and taped every TV appearance. She made my heart go pit-a-pat. My wife at the time, fortunately, joined me in this illicit little love affair, saying that she would agree to bigamy if the second wife could be Cecilia. Sadly, we were never able to make that happen. It all reached a climax in 1998 when my wife and I went to New York City on a pilgramage to the Met. They have special weekends just for out-of-town tourists, during which they put on four different productions in three days. One of them was Le Nozze di Figaro, starring Renee Fleming, Bryn Terfel (the world's most amazing baritone), and, yes, Cecilia. It was heavenly. When I moved to Nevada, much of my stuff had to remain in Minnesota due to lack of space. That included most of my music. As a result, I got out of the opera-listening habit, and gradually my Cecilia crush faded away. Today, though, something reminded me of it, and I went to YouTube and found clip after clip of her in various operatic roles and singing a variety of songs. I was transported back to when she had first enchanted me. There's somebody I love more these days, but Cecilia will always own a little piece of my heart--even if she never knows it. Here she is doing the achingly sad aria Sposa son disprezzata from a Vivaldi opera (lyrics with translation here). If it sounds familiar, it may be because this recording was featured prominently in a couple of episodes of The Sopranos on HBO. I forgot to post this soon after I took it, which was a couple of weeks ago at Imperial Palace. What you can't see here is the finishing touch: a big, skull-themed Ed Hardy watch. Interesting prop bet among some poker players whose names I do not recognize) about whether one of them will be able to run 70 miles in 24 hours, and the complications that ensue. Long, but worthwhile. After reading part 1, I was ready to join in the chastisement of the runner's friends for taking part in something that could seriously hurt their friend, but it's not necessary, because part 2 makes clear that they figured out that lesson on their own. Better late than never. And perhaps that's what really is the most difficult challenge for this generation of poker players. 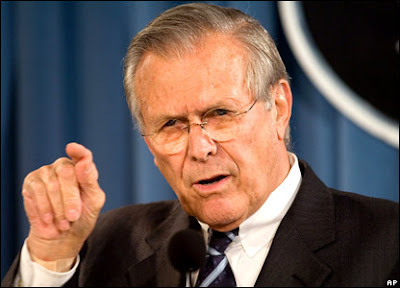 To infiltrate a world that is at its root, deeply unhealthy and imbalanced. To grab this bull called poker by its horns and to try to tame it for as long as we can. We hold on, and the bull bucks and tries to throw us into the droves of insanity around us. Some hold on, some don't. And maybe some are being dragged along the ground by this bull, and think they're still okay because they haven't let go. I remember writing over a year ago that as much as we learn about the game of poker, nobody really teaches us how to live as poker players. Nobody teaches us when we're supposed to let go of the bull. 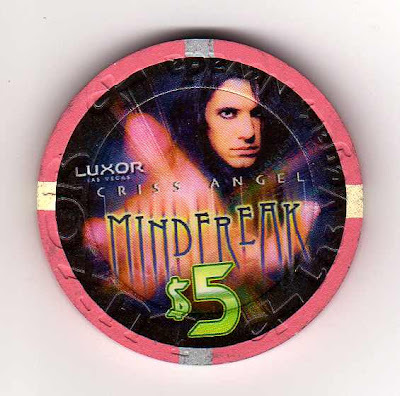 When Criss Angel first appeared at the Luxor, they put out special commemorative $5 chips with his picture on them. This is a pretty standard part of a casino's publicity blitz for a big new act. A couple of years ago, I explained in gory detail the proper method of stacking one's chips at the table. I'm sure some readers thought I was kidding, but I wasn't. During the first few hands after joining a game, it is far, far more important to segregate out the commemorative chips and get them hidden away from view than it is to do stuff like watching the action, figuring out how opponents are playing, and so forth. This is especially true at the Luxor, because the Criss Angel chips are just plain creepy. He's giving you the stinkeye, and if you leave his face exposed to view from the tops of your chip stacks, it will curse your game. These are just scientific facts, folks. The freaky chips must be buried underneath regular chips as quickly as possible. It is because of my habit of doing this that I noticed something recently. For the three years or so that Angel has been at the Luxor, the Angel poker chips have consistently amounted to a little under half of the total chips in circulation. I'd buy into a game, segregate my chips when I wasn't in a hand, and find that usually there were a few more generic chips than Angel chips, but a nearly equal balance. But last month when I played at the Luxor, after having not been there for a couple of months, there was a drastic change. I bought in for $200, and only 2 of the 40 chips were Angel ones. I thought this might be an anomaly (i.e., maybe the guy who had cashed out right before I got there separated his chips, too, so the ones I got weren't representative), but I watched the rest of that session as other players' chips went into the pot, and that ratio was fairly consistent throughout. This, however, was a one-time observation, a single data point. Last night I added a second one. I played at the Luxor again, bought in for $200, and had just one Angel chip among the 40 I was given. Again I watched chips going into the pot, and again the creepy chips were almost completely absent. This can't be a coincidence. The fraction of commemorative $5 chips cannot go from nearly 50% to less than 5% over the course of a couple of months without the casino taking active steps to make this happen. It appears that the Luxor has instructed its cashiers (or the people behind the cashiers, in the secluded counting/sorting area) to selectively take the Angel chips out of circulation as they come through. This is not unprecedented. I have written before about noticing that the Venetian had pulled its Gordie Brown chips out of circulation when he moved over to the Golden Nugget, and that Ceasars Palace had done the same when Celine Dion ended her run there. But if I'm right that the Luxor is deliberately pulling Criss Angel chips out of circulation, it will be the first time I've noticed this happening before the act is terminated. It makes me suspicious that somebody at the Luxor has already decided that Angel is on the way out. Obviously, I have no hard evidence of this, just this one very peculiar observation. It's no secret, of course, that his show has been struggling since it opened, almost universally panned by critics and ordinary patrons alike. Maybe I'm wrong. Maybe what I have observed is just a crazy fluke. Or maybe there's some other explanation for it. But my prediction is that before the end of the year, we will see Angel and the Luxor part ways, and this will have been one of the early indicators of it. The last ten days have been my worst-ever struggles with technology. My new computer had a catastrophic failure, as I mentioned several days ago. Turns out that one of the RAM modules went bad, which was causing all sorts of random, sudden crashes. Then either that or the extensive testing of them that I did to diagnose the problem caused the operating system to get corrupted, leading to inability to perform basic tasks (like access the Internet), even when the crashes had mostly ceased. A couple of days in the repair shop and about $250 later and I'm back in business. Nearly everything is working again. Now my main problem is mess and disorganization. The repair place did a partial data backup and restoration, then I had Carbonite send me my data back. That led to a bunch of duplication and confusion, especially since Carbonite stores and retrieves even stuff that I deleted weeks and even months ago. The hard drive is just a big mess now, making it hard to find stuff. But at least things are operational. I haven't played any online poker for these ten days now. I'll try it in a day or two to be sure that's all still working normally, too. I haven't specifically looked for my "casino photos" folder, but I'm confident that it's lurking in there somewhere. Sometime in the next few days I'll locate it and restart some GTC posts. I did lose about ten days of emails in the process--those that came in while things were haywire. It was my fault, because of how I reunited the email software with its previous cache of old messages. If you sent me something important and didn't get a reply, that's the reason. I think, though, that I managed to process all of the blog comments that came in via the Blogger dashboard. In the meantime, I had resurrected my old computer to use temporarily as a backup, and it started to fail in strange ways, too--first refusing to play any audio files, then refusing to connect to any network. It is rapidly becoming useful only as a doorstop. I don't know what's wrong with it, but it's really not worth spending time or money investigating at this point. To add insult to injury, last night my microwave oven suddenly went kaput. I wasn't even doing anything with it. I just glanced up at it to see what time it was, and noticed the display flashing 88:88. I tried the controls, and they were all unresponsive. Tried unplugging it for a while, but that did no good. I think I only paid about $60 for it when I moved here, but I'd still expect more than five years of life from it. I'm sure it would cost more to fix it than it would to buy a new one, so it will now just get thrown onto a landfill somewhere. I tell you, there's a scary revolt against the establishment going on, and I'm not talking about Cairo. My computer is back and apparently healthy, but I'm still having to do lots of work to restore everything to the way it was. Carbonite backup service is really paying off, but it's going to take more than another 24 hours to get everything back to me. For Super Bowl poker play, I decided to head to Binion's, for mostly arbitrary reasons: I hadn't been there in quite a while, didn't feel like driving anywhere, and it was a really nice day for a walk. Good choice, as it turned out. As I headed for the open Seat One, I noticed Tony Big Charles in Seat Two. We chatted a bit about his recent hospitalization and surgery, etc. One of my favorite dealers, Gina, was also playing. Things started badly when I raised a straddle, then fired on all three streets after having missed with A-10, and Tony called me all the way on a double-paired board. 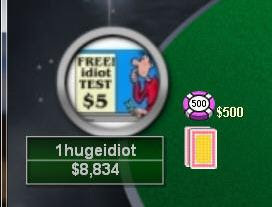 He had 9-9 and won a roughly $200 pot. I had thought that (1) he was on a flush draw that missed, and (2) he would remember that the last time we played, I almost stacked him with K-K, and on that basis be cautious about calling. Nope. Oh well. A few hands later things turned around when I flopped a set of 6s, not only stacking Gina, but earning an extra $100 because of a special Super Bowl promotion that was running. 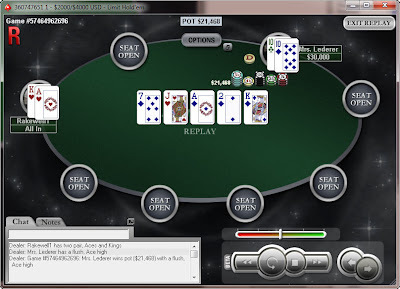 A short time after that I doubled up with A-A versus another guy's K-K, all in pre-flop. Less than an orbit later I stacked somebody else with K-K versus his J-J, again all in pre. Maybe 15 minutes passed before my Q-Q flopped a set and won a nice pot from somebody that I think had K-K (because it was the only time I saw him three-bet pre, and he folded disgustedly when I bet at the ace on the turn). Not too much later, Tony gave me back my money when he suspected I was bluffing again, but I actually had A-Q on a Q-Q-5 flop. He called me all the way with 6-6 in the hole. I played for about an hour and 15 minutes and left with an uptick of $573. 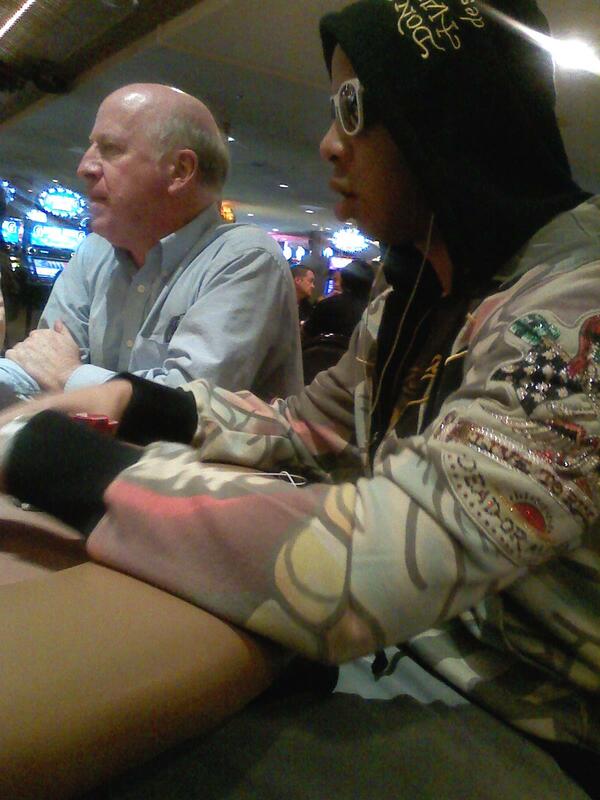 As I was racking up, Tony asked me if I always make money that fast. Wouldn't that be nice?! No, I don't. But I'm happy to have an occasional day where all I have to do is pick the lucky seat.